Barnes and Noble hasn’t given up on its Nook tablets—quite the contrary, in fact. Last month, the bookseller debuted its biggest Android reading tablet yet, a $129, 10.1-inch slab with room for up to 256GB of storage. And today, Barnes and Noble came out with another, much more affordable tablet: an updated version of its two-year-old, 7-inch Nook that costs only $49. The new Nook looks nearly identical to the previous model, which was the smallest Nook when it came out a couple of years ago. The black slate has a 7-inch, 1024×600 display on it, as well as a microUSB port for charging, a headphone jack, and a microSD card slot. The original tablet had a mere 8GB of onboard storage, but the new device starts at 16GB. With the microSD card slot, you can have up to 128GB of total storage—enough to support numerous e-books and a decent number of Android apps. In addition, the tablet has Wi-Fi and Bluetooth support, front- and rear-facing cameras (the former being a VGA camera and the latter being a 2MP shooter), and up to seven hours of battery life on a single charge. It’s certainly not the most capable Android tablet, but at $49, it’s one of the most affordable available. The Nook comes with connection to the Google Play Store, allowing users to install Android apps. This makes the device more versatile than Amazon’s Fire tablets. Those devices can only download apps from Amazon’s own app store natively, though users have found work-arounds to get Google Play onto Fire tablets as well. Nooks primarily serve as Barnes and Noble’s e-readers even if the availability of Android and Google Play expands their capabilities. The bookseller has faced stiff competition over the years from Amazon in the e-reader space, so much so that it only has one Kindle Paperwhite-esque device still available: the Nook GlowLight 3. Today, the company faces even more competition with Kobo coming back to the US with help from Walmart. Barnes and Noble has a wider variety of Nook Android tablets now that give users access to its e-bookstore and its Goodreads-like community app called the Browsery. The company may be hoping to undercut Amazon and Kobo on price: Kindles start at $79, while Kobo e-readers start at $119. 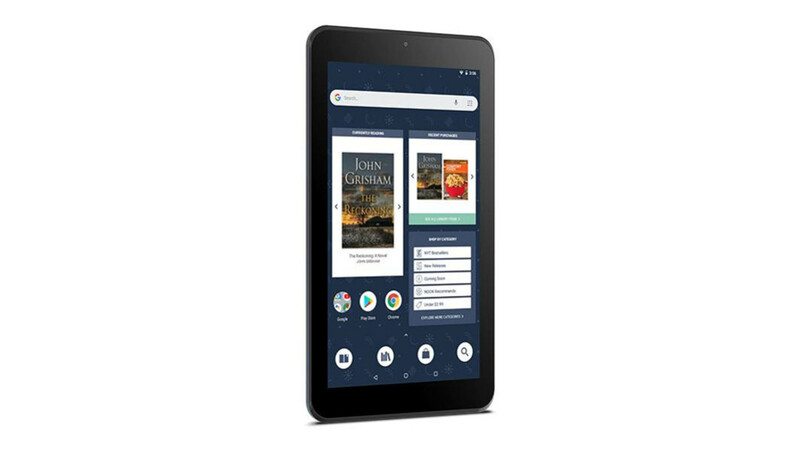 While Kindles can hit $49 at certain points throughout the year, Barnes and Noble may be able to attract users who want a low-cost Android tablet that can serve as both an e-reader and a portal to the Google Play Store. The new 7-inch Nook tablet is available today at Barnes and Noble stores and online.